Its a mixed blessing when we receive Independent films to review for this site. We are honored that so many talented people out there are willing to share their work with us and allow us the privilege of sharing our insights with readers. At the same time, not all the movies we receive are necessarily something we are willing to place our fan stamp of approval on. When a big budget studio puts out a “turkey” we feel it is our duty to say so before fans go out and drop nearly $10 at the theater. You certainly don’t have to take our words for it, however, you were warned. Independent films made on a shoestring budget and lacking Hollywood’s publicity machine, will never be skewered here. We give artists who create films as a labor of love and dedication a much wider berth. Consequently, if we don’t care for it (and that is not to say that if “we” don’t like it someone else won’t) we won’t rip it apart – we just will leave it off our blog. 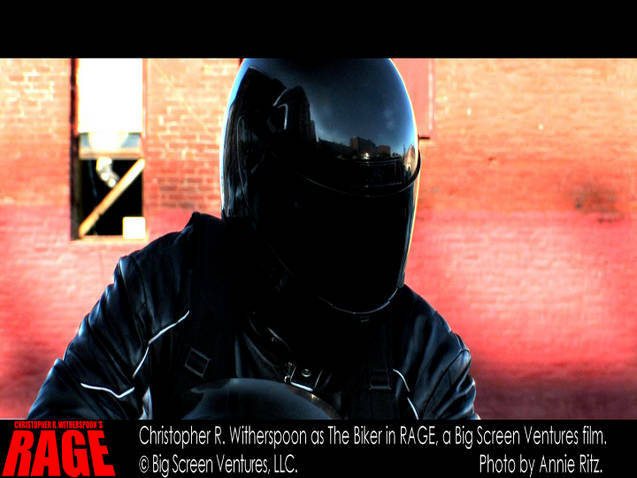 Recently, Independent film-maker, Christopher Witherspoon, shared his new film RAGE with us. I am happy to say that this film was a “cut” above many Indie films we’ve received. The film features a top-notch score, creative camera work, and a steady supply of suspense to keep viewers tuned in! 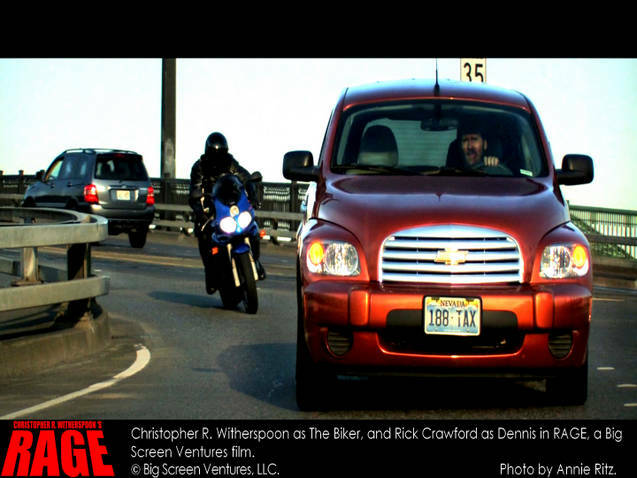 Featuring an average man (Dennis played by Rick Crawford) who, while attempting to correct some bad judgement in his personal life, inadvertently gets caught up in a tense “cat and mouse” game with a psychotic biker. In many ways the film played homage to Steven Spielberg’s lesser know classic DUEL (which we discussed HERE) while effectively carving its own niche in the horror landscape. Despite the lead characters flaws, the viewer feels for his dilemma and the mute/faceless antagonist raises the fright level to a fever pitch! We were pleased with the film and feels it shows great promise for its creator, Christopher Witherspoon. We were are also pleased that he agreed to do an interview with us and hope’s it will inspire you to take the movie for a spin, yourself! DAVE FUENTES: Tell us what experience you had with film making prior to RAGE. 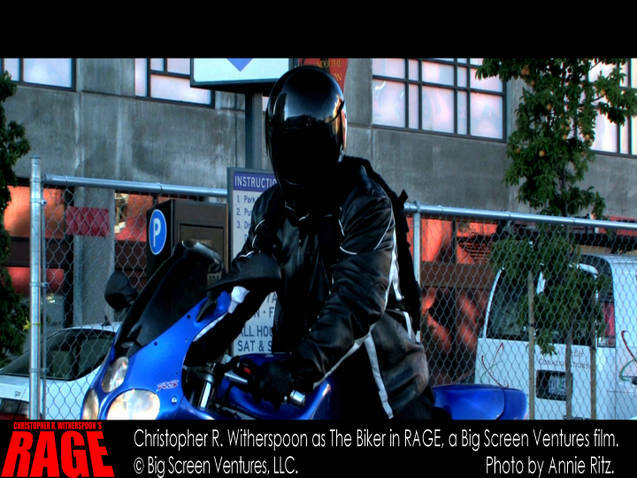 CHRISTOPHER: Prior to making Rage I made one other feature, a drama entitled Middle Man, back in 2004. Before that I worked in different capacities on many productions. For a period of time I worked as an effects artist for effects master John Carl Buechler on films like Re-Animator, Troll, Ghoulies and From Beyond. 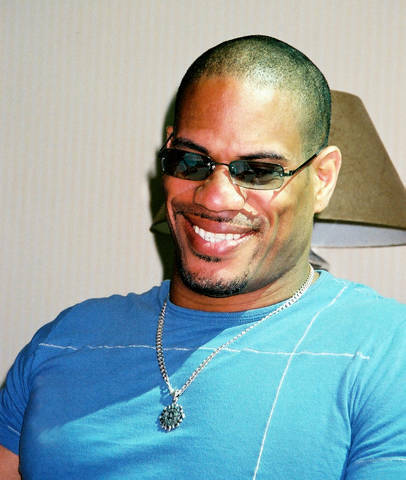 I also spent several years directing music videos and commercials. Yes I’m a big fan of Duel I saw it when it originally aired on television when I was a little kid and it always stuck with me. It was such a tense film and it was the first time I realized that the director was responsible for creating this feeling and that excited me. This was the moment I knew I wanted to create this feeling for an audience as well. DAVE FUENTES: So it’s safe to assume that you are a huge fan of that movie? CHRISTOPHER: Yes I’m a big fan of Duel I saw it when it originally aired on television when I was a little kid and it always stuck with me. It was such a tense film and it was the first time I realized that the director was responsible for creating this feeling and that excited me. This was the moment I knew I wanted to create this feeling for an audience as well. DAVE FUENTES: In regards to casting, what qualities were you looking for in the character of Dennis? CHRISTOPHER: Believe it or not I was looking for “likeability”. That was important because the Dennis character was not such a likable person. He is having an affair, cheating on his wife and is extremely selfish. I needed people to not hate him from start to finish which most people by the end of the film will most certainly do and deservedly so. I was very lucky to get Rick Crawford who visually met the criteria and is a very good actor so selecting him was easy. DAVE FUENTES: How long did it take to film RAGE and when is it scheduled to be released? CHRISTOPHER: Rage was filmed in 24 days and the post-production took about a year. Regarding a release date, we are currently talking with several distributors and hope to announce a distribution date before the year is out. DAVE FUENTES: Due to the references to “karma” in the film (or Newton’s Law of “Cause and Effect”) as discussed by the lead character’s psychiatrist/friend, is it safe to assume that you are a spiritual person and that this is as much a morality tale as it is a horror film? CHRISTOPHER: Yes I do consider myself to be a spiritual person and Rage is most definitely a morality tale. To be honest, what the film is really about is the decisions that people make and how those decisions impact not only the individual but also everyone around that person. The Biker really only exists as a story device that is used to expose Dennis’s failings as a husband and a human being. So where Duel, thematically, was about “man vs. nature” Rage is about “man vs. self”. DAVE FUENTES: Is there anything else you’d like to potential fans regarding this or any future projects? CHRISTOPHER: First of all I want to thank you very much for taking the time to talk with me about Rage and I would love to tell everyone about my next project. It’s a horror anthology entitled, “The Twilight Hotel”. 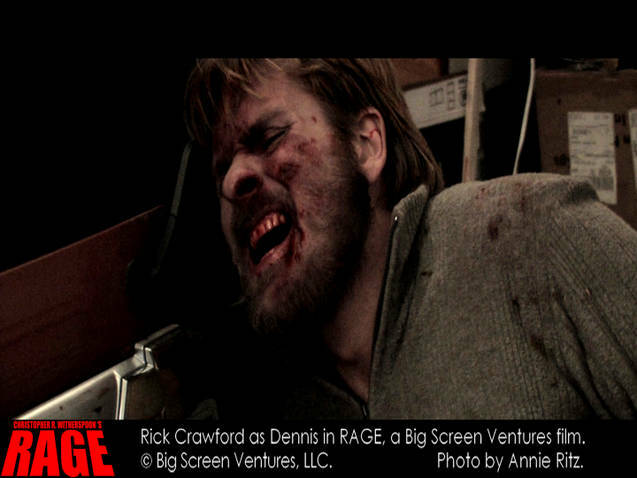 I’m working again with the Rage producers Darrell Smith, Suzanne Mitchell and Shawn Smith. Also, I’ll have a co-director named Bret Arnold. I originally wanted to make this film before Rage. I realized it was going to cost too much money to produce, so I put it on the back burner. Now I am ready to make it. The idea for this project came out of a question I’ve asked myself for decades… “What would’ve happened if Alfred Hitchcock had directed episodes of the Twilight Zone?” The Twilight Hotel takes place in an old 1920s, rundown art deco hotel where people of dubious character check in and must deal with their personal demons…literally. The Twilight Hotel will embody all the trademark qualities of Hitchcock’s, suspense and mystery while also having the surprise twist endings and supernatural aspects of the Twilight Zone. I hope to have funding in place as soon as possible and look to start production by next summer. The Daves would like to thank Christopher Witherspoon for sharing his work with us! 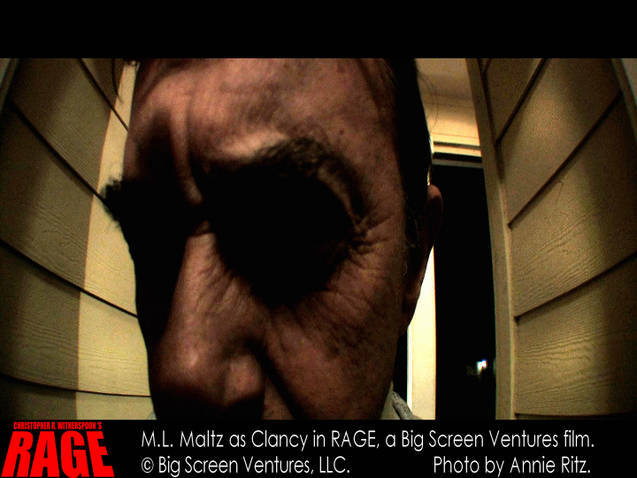 Stay tuned for upcoming announcements regarding the release of RAGE! This entry was posted in Movie Reviews and tagged CHRISTOPHER WITHERSPOON, DUEL, Independent Horror Films, RAGE, STEVEN SPIELBERG. Bookmark the permalink. ← Revenge of When Animals Attack: Man vs Nature Films!